A young boy stands against the knife-thrower’s wheel, ten blades embedded in his side, giving a sense of pain and loss. This is not how the performance was supposed to end! But even when it seems that all is lost and there might be no saving the little boy, we look to his eyes, wide and full of defiance and mischief. All is not as it seems, and this is not the end. The wounds are not fatal and both throwing master and assistance must re-evaluate what occurred to move forward and improve. This card represents an unexpected defeat, but rather than warning against it, it prepares you for this loss, advising you that at your darkest hour, there is still hope. When you reach your lowest point, the only way to go is up, if you you can drag yourself high enough to see it. 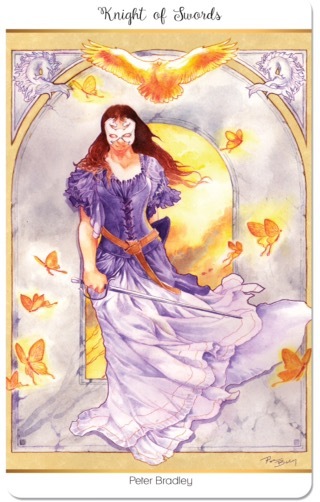 This entry was posted in Deck Review, Featured Card of the Day, General Tarot, Readings and tagged 10 of Swords, 78 Tarot, Artist, Carnival, Guidance, Path, Reading, Tarot. “The eight of pentacles usually shows a man laboring over his workbench to make eight gold coins, completely focused on the task with the town in the background. I wanted to expand the traditional imagery and update it a bit, as well as put in the context of the carnival. On a beautiful, clear day at the circus, many people are wandering around and enjoying themselves. To one side of this enjoyment, a young woman stands by a high-striker game. Her face is set, her concentration obvious as she psychs herself up to strike with the hammer. This is no tourist trying her luck, her strength is clear from the muscles beneath her shirt, which is decorated with a hammer, the symbol of strength. She is a strong woman, well-trained, and testing herself. This card represents effort and diligence, emphasizing that in order to succeed within the material world, you need to be prepared to work hard, to train and push yourself further and further. Be it pushing yourself physically to better healthm or to strive harder for more financial rewards. This entry was posted in Deck Review, General Tarot, Readings and tagged 78 Tarot, 8 of Pentacles, Artist, Carnival, Guidance, Path, Reading, Tarot. “When envisioning the Page of Cups, I immediately had a strong connection with the notion of creative beginnings. When your muse tugs at your sleeve, luring you along untrodden paths and possible detours – it usually pays to just run along and frolic in the endless possibilities. A child tries to conjure a rabbit out of his hat, but to his amazement, he conjures up a little dog. Nose to nose, some unheard conversation occurs between them, as the dog inspires this young illusionist to dream and aspire. The idea has been brewing for some time – his mobile is full of circus performers, ad a past virtuoso proudly hangs on a poster in his room. A royally-attired page sits beneath the poster, and a toy dog, identical to the one speaking to him from his “cup” – the top hat, sits behind him. All he needed was to give into his passions, and play. 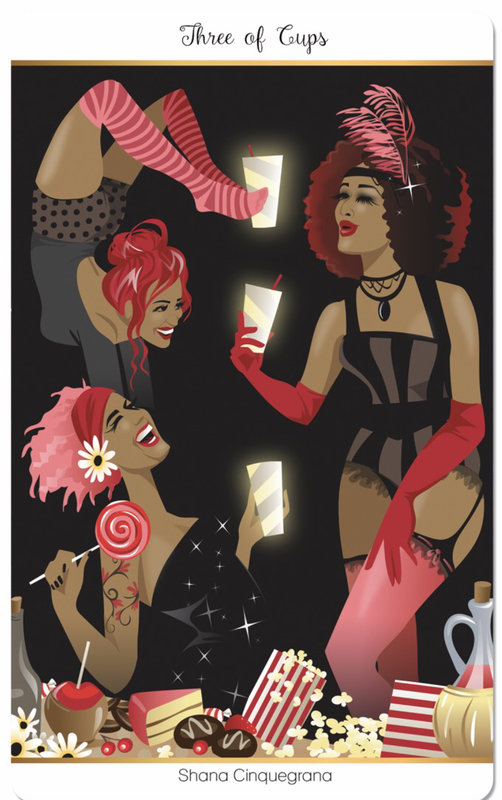 This card suggests the need for a little fun – allow yourself to indulge in your emotions, and let them show. Be creative, act on a hunch, and allow the inspiration to flow, without being penned in by adult cares. This entry was posted in Deck Review, Featured Card of the Day, General Tarot, Readings and tagged 78 Tarot, Artist, Carnival, Guidance, Page of Cups, Path, Reading, Tarot. A young, dynamic woman rushes forward, sword in hand to confront the future. Her purity of purpose is shown in the white horse mask she wears as she rushes headlong into whatever awaits her. She focuses only on the path ahead of her, never looking back and therefore unaware of the gathering storm behind her of the trees and her skirts whipped up by strong winds., All around her, butterflies flit and flutter hastily to get out of her way. A raptor, her guide in this endeavor, gives her clarity of mind as she embarks on her quest. This card represents an energetic, hasty figure, seeking their goal with unbridled inspiration and determination. They cannot tolerate delay, and sometimes dash in without realizing the consequences of their actions. This entry was posted in Deck Review, Featured Card of the Day, General Tarot, Readings and tagged 78 Tarot, Artist, Carnival, Guidance, Knight of Swords, Path, Reading, Tarot. A happy, young clown stands with a chalice resting on her head, steadied by her hands. She does not hoard this cup to herself, but holds it high, showing it proudly and inviting you to join the show., Red velvet curtains, bordering the jeweled paddling pool suggest abundance – but an emotional richness, rather than a material opulence. A dove drops a heart into the cup, which overflows with water – five streams flowing down her body and into a pool of lotus blossoms. The addition of the dove and lotus blossoms, both of which represent spirituality, to the emotional symbolism of the water shows that her feelings bring her serenity. This card heralds the start of a friendship or relationship that will bring not just joy but and inner peace. This entry was posted in Deck Review, Featured Card of the Day, General Tarot, Readings and tagged 78 Tarot, Ace of Cups, Artist, Carnival, Guidance, Path, Reading, Tarot. “I chose to represent my querant in the female form and a very cheeky view it is. With reference to her carnival past in the form of her tattoos. I had not chosen the tattoos before commencing the painting, but found they flowed from the conscious self. I love that the tattoos symbolically represent the elements of the three of wands, that I am drawn to at this time in my life. 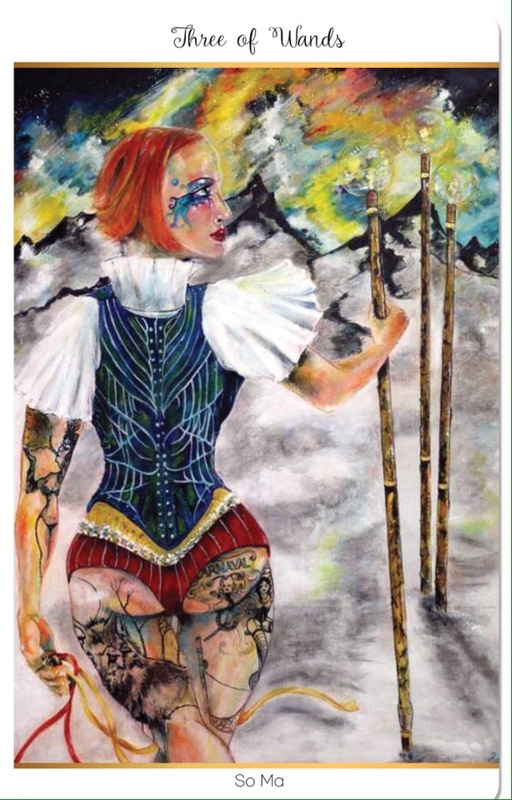 A tattooed lady stands facing a long path towards a vast mountain range – she wears her tattoos proudly as a reminder of her past, and what she has already achieved. Over the mountains, the northern lights are visible, a tempting dance of color that entices and inspires. She surveys the landscape, aware of the task ahead, and the prospects that the journey brings. She has planted three wands along the path, torches to light her way onwards – although she is still immobile, the decision has been made, and she is both mentally and physically preparing to move forward. This card urges us to keep building on our current success. To indulge in a brief pause, using this to reflect on our past achievements, concentrate on the path we wish to take now, plan for the next stage of our jour ney and then take the plunge. This entry was posted in Deck Review, Featured Card of the Day, General Tarot, Readings and tagged 3 of Wands, 78 Tarot, Artist, Carnival, Guidance, Path, Reading, Tarot. Three circus acrobats celebrate a successful show in their dressing room with a banquet of popcorn, toffee apples and other sweet treats. The contortionist raises a cup in salute of her colleagues, but with her feet rater than her hands. Laughter rings out as high spirits reign – her friends are amused, but their hilarity is met with joy, rather than resentment. This card reminds us what can be achieved through friendship – heartbreak decreased, sorrow dissolved, accomplishments celebrated and joy created. It prompts us to spend time with family and friends, enjoying the feeling of companionship, and to bask in the warmth it brings. 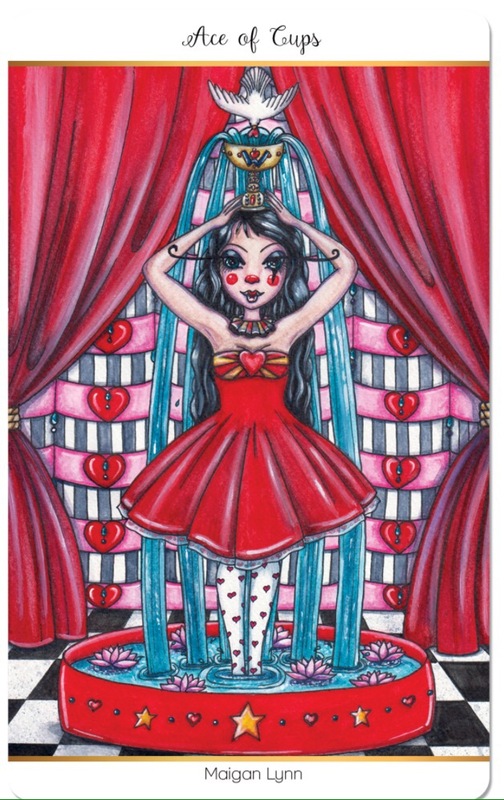 This entry was posted in Deck Review, Featured Card of the Day, General Tarot and tagged 3 of Cups, 78 Tarot, Artist, Carnival, Guidance, Path, Reading, Tarot.